Sure appreciate your acknowledgment of my recent sale, Sue~~many thanks!!! Thank you very much, Wanda!!! Many thanks to the buyer from Spring, TX, U.S.A. for purchasing a print of "Evening Luster" on November 16, 2012. Hope it's enjoyed for many years to come!!! Sincere thanks, Danielle, for your comment on my image and it's sale!!! Many thanks for your comment on my sale, Kim!! Lori~~sincere thanks for commenting on my sale!! Beautiful Bill!... Congrats on your Sale! Chrisann~~many thanks for the comment on my image and it's sale!!! Sure appreciate your comment on my image and sale! Thank you, Bob & Nancy!! That's alright, Kay~~Bill is fine!!! Congrats Bill, on your sale of this beauty!!! Many thanks, Kay, for commenting on my sale and image!!! Will, congratulations on the sale of this fantastic image! Lainie~~sure appreciate your fine comment and mention of my sale! Thanks very much!!! Congrats on your sale, Will! Sincere thanks, Sandra, for commenting on my sale!!! Nava Jo~~many thanks for acknowledging my sale and for the vote!!! Congrats on your sale, Will! The framing that the buyer picked out fits this beautiful photo perfectly. I certainly value your comment on my sale and image, Carol~~thank you!! Thank you very much, Phil, for commenting on my sale!!! Randy~~many thanks for your comment and ongoing support!!! Sincere thanks, Andee, for commenting on my image and sale!!! Congratulations on another sale, Will ! Very much appreciate your acknowledgment of my sale, Mel...!! Ronald~~thank you for commenting on my sale!!! 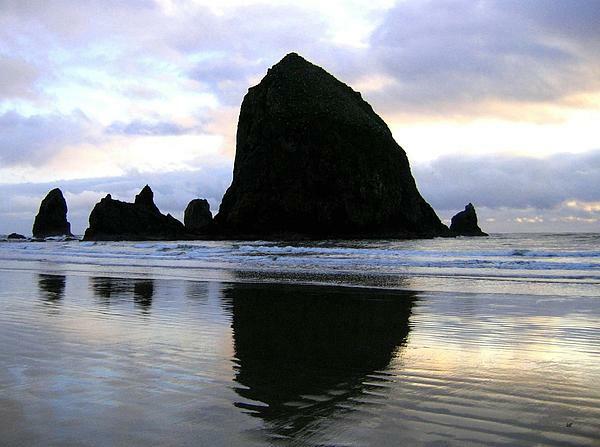 Haystack Rock rises 235 feet out of the sand and sea in beautiful Cannon Beach, Oregon. It's the breeding home of four species of sea birds: Tufted Puffins, Pelagic Cormorants, Pigeon Guillemots, and Western Gulls. 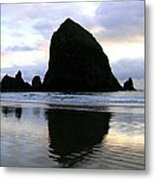 Silhouetted Haystack Rock and the soft evening light are mirrored in the the wet sand to create an inspiring image. "Evening Luster"